Whether it’s the famed Grand Slam or the venerable Moons over My Hammy, Denny’s has cemented a legacy in Americana with iconic dishes in its diner-style restaurants. 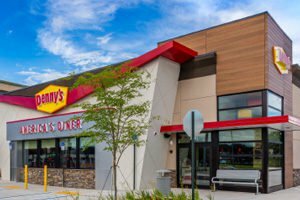 Now, with over 1,700 locations, Denny’s has come face to face with many of the same challenges as other chains: protecting their business model, maintaining sales, and retaining happy customers. As the restaurant landscape shifts to fast-casual, walk-in/walk-out dining, online ordering systems, delivery services, and other convenience-driven innovations Denny’s restaurants and their franchisees have continued to hold up alongside changing trends and passing fads. Specifically, they’ve remained competitive by taking new approaches to loss prevention, employee engagement, and enhancing the customer’s dining experience. Other, less visible, forms of unethical practices such as manipulating order entry and ticketing systems also became a prevalent issue. Morris says that the potential for unauthorized team financial incentives in individual locations could lead to employees to doctor orders to falsely improve ticket response times, which both erodes the service standards of the Denny’s brand and adversely and directly impacts the customer’s experience. More concerning is that despite knowing these activities—theft, unauthorized transactions, or even ticket systems manipulation—are happening, Morris’s team could take only a reactive approach to resolving them because of the company’s geographically dispersed locations and a heavy reliance on manual loss prevention processes. Success in today’s restaurant business requires striking a balance between maintaining a strong commitment to outstanding customer service and minimizing unnecessary losses on the balance sheet. To accomplish both, Morris turned to Envysion to give him and the RJC leadership team complete visibility and insight into every element of the company’s operations, no matter the location or time. At a time when the restaurant industry has been forced to lower service and hiring standards, Morris wanted to reverse the trend and set his business apart. He selected Envysion Managed Video to be the cornerstone of his team’s efforts to ensure that food preparation and customer service met brand expectations and that all business operations from both the front and back of the house were carried out ethically, legally, and to RJC’s ideals. The cloud-base Envysion Managed Video platform features unobtrusive high-def cameras and microphones to capture true-to-life activity in any scenario, enabling local managers to keep tabs—remotely or in-store—on customer interactions and in-store activity in real time. Meanwhile, audio and video from every vantage point is recorded and securely stored, making it easy for Morris or other authorized users to recall footage from any timeframe to compare every point of sale (POS) transaction with related and time-stamped video or closely observe a multitude of back-end activities where loss and risk frequently occur. Whether it’s too-slow food preparation, skimming discounts or comping guests without approval, or other risks like fraudulent complaints, accidents, or worker’s comp claims, Envysion provides the clarity and visibility RJC leaders need to take decisive and appropriate actions quickly. The system enables company leaders to actively review in-store operations and employee behavior from any internet connected device. Then when problematic behavior or service issues occur, managers instantly receive an alert to stream the video, assess, and then resolve situations that would have previously required a long, drawn-out process of investigation. Growing a restaurant franchise demands a certain level of agility and flexibility. For Morris, having 33 locations spread across five states means that not every restaurant has the same set of concerns. Whereas one store might be dealing with POS theft, another might be grappling with an uptick in fraudulent workers’ comp claims. Envysion’s Managed Video Solution can be configured for each store to allow Morris and his team to handle several incidents per week at various locations with confidence and efficiency. Being able to pivot and quickly address new claims or incidents is essential to preventing further loss while empowering both HR teams and regional managers to take a more proactive approach to employee development and engagement.